Fountains in Rome. The Nasoni (big noses), Rome’s fountains Upon a proposal by the first mayor of the United Capital Luigi Pianciani and the councillor Rinazzi, the city council realised in 1874 a series of public fountains. 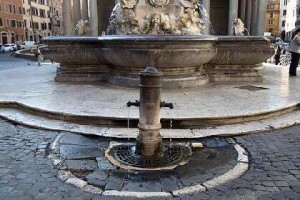 The fountains were in cast iron, cylindrical, 120 cm high and provided by tree simple spigots, from which the water fell directly in the sewage pipe, through a grate, on the basis of the road surface. The only decoration was constituted by dragon’s heads, which supported the spout. 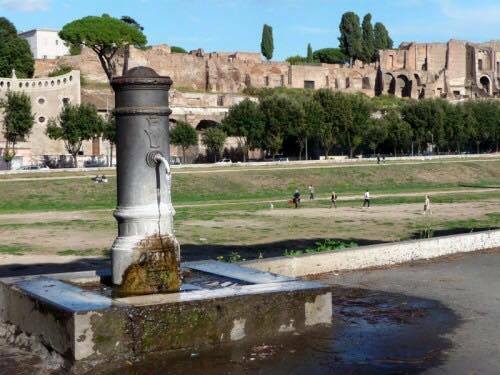 The dragon’s heads disappeared from the successive models very soon and only one metallic curved spout simply remained, this suggested to Roman citizens the term nasone, with which these fountains are still well-known. 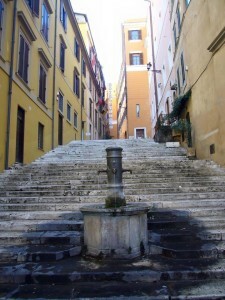 One of the oldest but still functioning fountain is in Piazza della Rotonda (Pantheon), a couple of meters from the fountain of the same name; while a very modern reconstruction, with all tree spouts, is in via delle Tre Cannelle, this one took the name from the ancestor fountain of the nasoni. 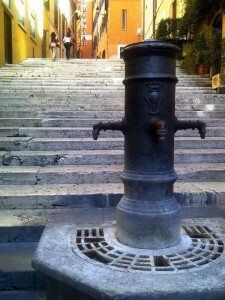 In the attempt of containing the waste of water (which, admittedly, runs freely and continuously), soon after 1980 the city council modified many of these nasoni with the application of a mechanism (a metallic roller or a button) on a brass spout, situated higher up than the original one, which was removed. The water consumption was drastically reduced, in this way the typical fountain lost its main characteristic element, but then the innovation proved to be unsightly and unpractised as well. The city council abandoned the project early, also due to the vandals, in any case the damage was already done. In the territory of Rome’s city council these nasoni are about 2.500, 2580 are inside the walls; in addition to them, there are more than 114 different kinds of fountains, which supply water for free to Roman inhabitants, tourists and animals. In 2009 the Municipally Utility of Rome (ACEA), which focuses on the provision of water and light, realised a tourist guide to celebrate its 100 years of existence and enable tourists to discover the historical nasoni. It’s a brochure whose title is “Water is a treasure”. It contains itineraries along the streets of the old town centre. Please feel free to contact us for an estimate and we can arrange a tailor-made package to suit your needs. For any information whatsoever we are at your complete disposal to ensure a wonderful and unforgettable stay, immersed in cultural attractions, art, culinary delights, scenery and traditions.